Anonymous sale; Sotheby's London, 4 July 1997, lot 128. The Soho cabinet-maker George Minter, who filed various 'reclining chair' patents, established premises at 26 Princes Street, London in 1829, and acquired his brass fittings from his Wardour Street neighbours Joseph, Daniel and Thomas Munyard. 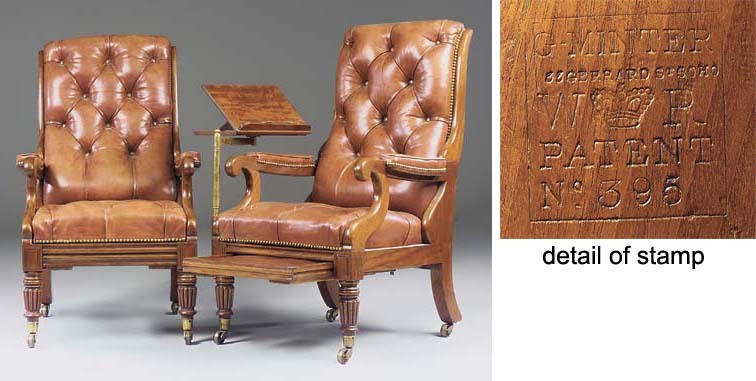 By 1832, the date on the second chair, he had moved to 33 Gerard Street.